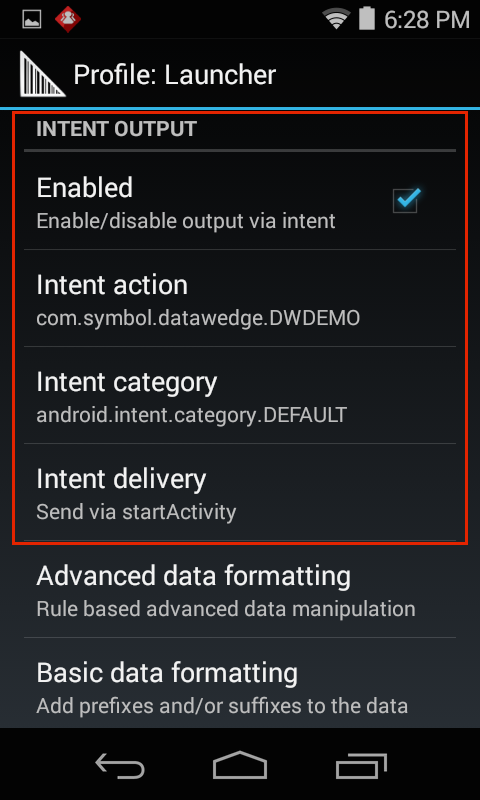 Intent Output sends the processed data to the associated foreground application as payload within an Android intent. This allows acquired data to be passed programmatically to an application, where it can be consumed or processed further. The core components of an application (its activities, services, and broadcast receivers) also can be activated by intents. An intent object is a bundle of information that describes a desired action. It includes the data to be acted upon, the category of component that should perform the action and other pertinent instructions. When an intent is initiated, Android locates an appropriate component to respond to the intent, launches a new instance of the component (if needed), and passes the intent object to it. ...the Intent action in the Intent is com.myapp.action and the Intent category is android.intent.category.DEFAULT. When combined, these two values can be like a "channel" to which an app can listen for intents that use the same combination, filtering out the "noise" from other intents that use different value pairs. String DECODE_DATA_TAG = "com.symbol.datawedge.decode_data"; Decode data is returned as a list of byte arrays. In most cases there will be one byte array per decode. For barcode symbologies that support concatenation (i.e. Codabar, Code128, MicroPDF, etc.) the decoded data is stored in multiple byte arrays (one byte array per bar code). Clients can get data in each byte array by passing an index.